Nose Jammer creates a cloud around you which jams big game's ability to detect and track human odor. 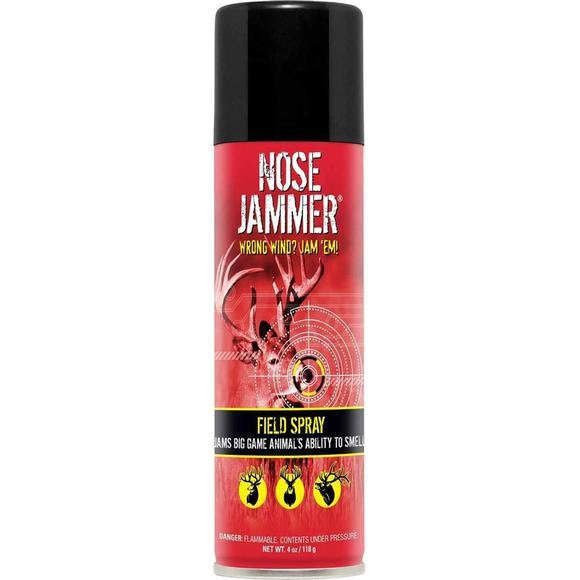 Nose Jammer should be sprayed on clothes, boots, tree stands, blinds and brush. When the wind swirls, critters olfactory gets jammed and they stay unalarmed. Use Nose Jammer Field Spray in conjunction with the rest of the line of Nose Jammer products for best results. Nose Jammer creates a cloud around you which jams big game&apos;s ability to detect and track human odor. Nose Jammer should be sprayed on clothes, boots, tree stands, blinds and brush. When the wind swirls, critters olfactory gets jammed and they stay unalarmed. Use Nose Jammer Field Spray in conjunction with the rest of the line of Nose Jammer products for best results. Works on all critters with a nose! Note: Contents under pressure, ground shipping only.